Tags: new content, bw2, nate. Nate may have his foibles, especially when it comes to fire, but he's managed to actually save some of his treasure. Of course, he didn't think the Plains would ever come to harm! Help him rescue his treasure stash, before the infection of the Red Man seals the crates forever! Talk about Nate's gooey adventure on the forums! And don't forget your disinfectant! 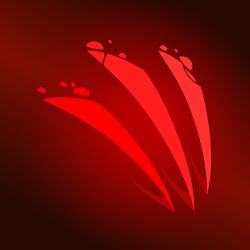 Tags: new, content, objectives, crusaders, idols, event, carnage, cup, football, crusaders. It's that time of year for picking up the ol' pigskin, smashing into a group of men geared up in armour to spike the said pigskin into the end zone in celebration. As the single biggest sports fan of the group, Jim the Lumberjack is beside himself with excitement for the major sports event in the Crusader calendar: The Carnage Cup. Rounding up the fellow Crusaders he decides to throw a tailgate party ahead of the big game. Unfortunately for Jim, it all goes wrong very quickly and soon the Crusaders have to destroy swathes of monsters before he and team can enjoy the sporting festivities. Packing together in the new football formation, the Crusaders have a chance to add two new characters to their ranks. 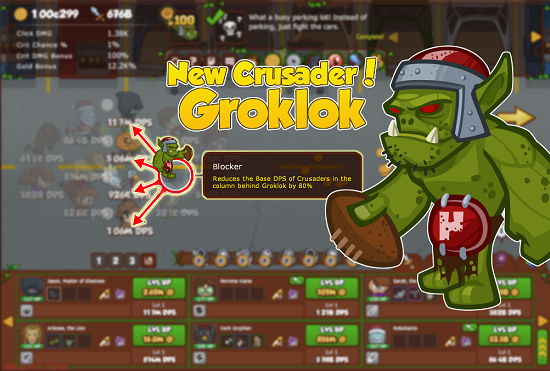 Groklok the Orc is a beast of a linebacker who's abilities include increasing the DPS of Crusaders in front of him by 150% among other abilities. Drizzle the Dark Elf is the nimble, tricky running-back. Drizzle enjoys a unique partnership with Groklok. Just like the best players, they can combine in various ways to maximize their tactics. Playing Drizzle in front of Groklok will buff his formation ability by 100%. If Drizzle and Groklok play alongside each other, the combined skills buff Groklok's DPS by 400%. When Groklok is blocking and tackling in any column in front of Drizzle, Groklok's line gets a health buff and takes less damage. Both new Crusaders require some training to play with their new team. The Crusaders will need to complete the first two objectives for the new campaign to add both players to their rosters. In the first objective, Groklok's ponderous pre-training skills will debuff the DPS of all the Crusaders behind him as he fails to block the attacks of the incoming monsters. In the second objective, Drizzle's lack of teamwork will disable the formation abilities of all adjacent Crusaders. This event we're honouring two more YouTube celebrities who have been producing awesome Crusaders videos. Again, just like MrBayEasy, you'll find them as boss monsters within the game. Keep an eye out for them as you play. Bensch hails from Germany and has produced more than sixty Let's Play videos so far. 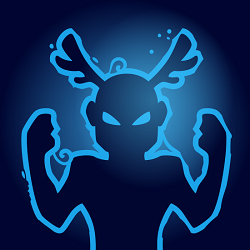 Brothgar is one of our more recent YouTube friends who is also a massive Clicker/Idle gamer. Check out both their channels and subscribe. So, what are you waiting for? Establish your running game, dominate the line of scrimmage, pound it out on the ground, and stick to your game plan. VICTORIA, BRITISH COLUMBIA, January 27, 2016 – Codename Entertainment announced today that it's award-winning game, Crusaders of the Lost Idols has launched on Kizi.com, a leading online games portal. 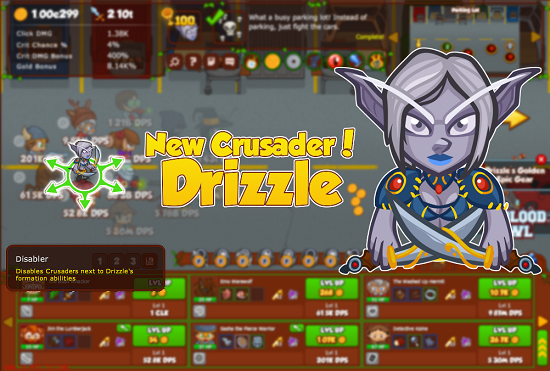 Kizi has more than 30 million players globally, plus over 800,000 fans on Facebook and offers idle and clicker games fans a new, alternative way to play Crusaders on PC and Mac. Crusaders is a top rated Idle/Clicker game that has been played over 10 million times on across all platforms since its launch in July of last year. Crusaders of the Lost Idols is the only idle/clicker game to include a strategic formation feature where players learn to master the art of organizing their group of characters into the most powerful arrangement possible. The position of each Crusader in relation to his or her companions has a significant effect their attack strength. Combined with Crusaders enhanced by buffs and upgrades, this unique feature adds an unrivaled complexity never before seen in the idle genre. ABOUT CODENAME ENTERTAINMENT: Codename Entertainment was founded in 2008 in Victoria, B.C. by David Whittaker and Justin Stocks. They started making games for Facebook and evolved into making games for platforms like Kongregate.com, ArmorGames, and Steam. In 2015, the company launched Crusaders of the Lost Idols. It was awarded the Idle Game of the Year on Armor Games, is the top rated Idle Game on Kongregate.com, has over 10 million unique plays, and more than 1.1 million hours played per month on Steam. Tags: talent, tree, idols, crusaders, prestige. 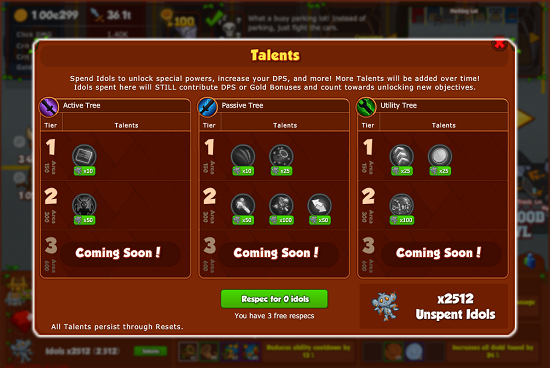 Christmas may have been a month ago, but we have another gift for you to unwrap: a brand new update to Talents! For those of you unfamiliar with Talents, these are unique additional features and powers that are available in exchange for your hard-earned Idols. The Talents require you to have cleared up to a certain area level on any objective before you can start trading your Idols, but they are worth the effort. You won't lose any DPS gains when you exchange your idols. You'll always keep your total DPS bonuses in keeping with the total number of idols you've earned since you started playing. You can read more about the first talents we launched last year here. However, we don't want to keep you in suspense so here are the details for the new Talents. Timed abilities last 5% longer. Each 1% of Critical Click Chance increases DPS by 1% (Max Level: 50). Each 1% of Cooldown over max increases DPS by 0.25% (Max Level:50). 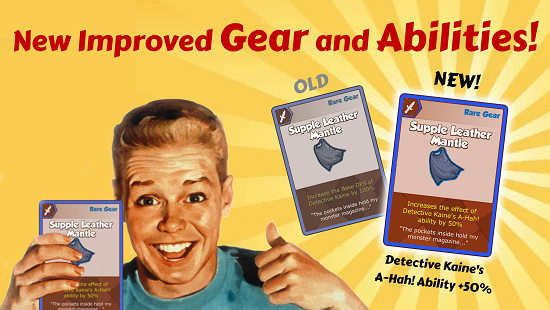 Buffs last 10% longer (Max Level:20). Enchantment point effectiveness increase by 20% (Max Level: 50). Crusaders with all three equipment slots filled do 20% more DPS (Max Level: 50). Crusaders in the same bench slot share 5% more EP (Max Level:14). But what if I change my mind? Have no fear, we're giving you three chances to respec (re-specialize). You can reclaim all your spent idols and spend them again to suit your playing style. After your three free respecs are used up, you can continue to reset your Talents but it will cost a percentage of your idols to do so. 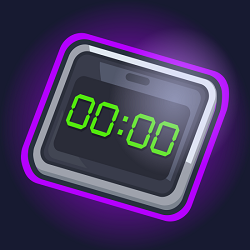 We hope you enjoy the update and, as before, we'll be releasing more Talents and features in the future. Keep your feedback coming and let us know what you think of the latest additions. 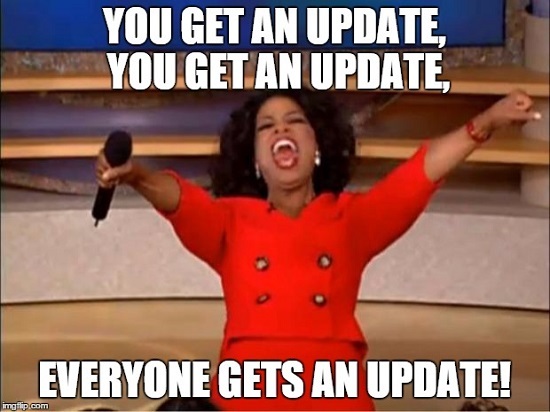 Tags: new content, bw2, patch notes. 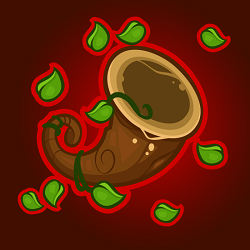 Today in Bush Whacker 2 we're doing some minor housekeeping, but it is something you've long been asking for! Now when you do the Mount Taming quest for Clint, if the colour of mount you get from your fourth batch of feed isn't the one you want, you can refuse it, and go hunt down another colour! Plus, for more variety, we've added three (3) new mount colours, with matching Horse Armor in Cloudland! Can you collect all six? The Knight Chess Piece ranch item can now be flipped. Event Ribbons from 2015 and earlier now include the year they are from in their description. The Ranch Tractor is now available in Sasha's gifting store to send to a friend. As well, this weekend the Nate's Birthday 2016 event pets are available. Bomb Sniffing Dog - Changes a percent your Nothing wins into Gold. Fire Duck - Increases your chance to win less Nothings. Flame Kitty - Changes a percent of your Nothing wins into random energy, mana, and power. Talk about your favourite colour of mount on the forums! Big Update to Crusaders! Changes to Loot and Abilities. Tags: big, update, crusaders, loot, abilities. One of the best things about creating Crusaders is that we have been overwhelmed and honoured by the excellent and invested community feedback. You have all been amazing in sending us your thoughts as you've collectively spent millions of hours playing Crusaders. 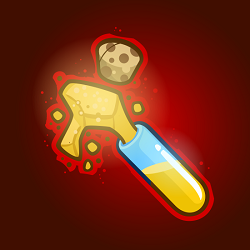 We've injected awesome into to the most significant areas of the game. 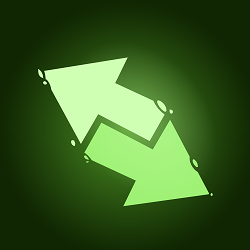 From today, we have changed all the gear that was deemed less than useful for everyone, made Epics more Epic, and added new Crusader abilities. These changes will benefit ALL players both going forward AND retroactively. All your previously collected loot will get the update! 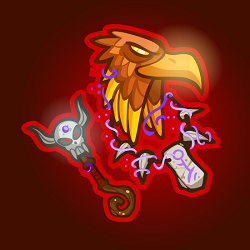 For instance, Jason, Master of Shadows now has a gold boosting item to make him as useful as Pete, the Carney. Plus, Jason has a brand new ability where his DPS will be boosted when his formation friend is being attacked. Now you can partner him with a tank character for maximum effect. Old Bonus: +100% DPS for Detective Kaine. New Bonus: +50% Increase for Kaine's A-Ha! Ability. Phoenix now lives up to her billing as a creature of death and rebirth. Her Vengeful Fury ability can now trigger when any other Crusader bites the dust. Her new ability gives you the option of putting her at the back of your formation and watching as monsters kill themselves trying to get to her. Another update to Phoenix includes the skill to grant a Max Health boost to her fellow Crusaders when they lose a comrade. This will help your remaining Crusaders stay alive longer as they battle on against the monsters and hopefully help you turn the tide! King Reginald now buffs all Royal Crusaders, as a king should. The Princess, Prince Sal, and Thalia the Thunder King, along with any future royal Crusaders, will get a DPS boost when you've unlocked Reggie's new ability if they're in formation with him. There's a metric ton of other changes too and the full details are in the patch notes, available in the forums. We're looking forward to hearing your thoughts and feedback on the changes and as ever, we are always listening. Thanks for being awesome! Tags: new content, event, bw2. Then it seems Nate needs decorations and activities to set up in the Commons. Go out daily and find things for his party. Have fun trying out the activities as many times as you want! If you're trying to get Tiny Little Arms or Just Like Nate achievements, you need to be wearing all pieces of the Dragon gear or the Nate outfit (available from the vendor's Bush Bucks store if it's your first time playing this event) while completing the 4 party Stations: Dynamite Activity, Campfire Activity, Digging Activity and the Training Whacking Activity. There's always time for more parties, no? 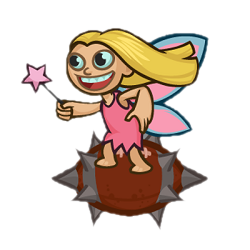 As the event progresses, stay tuned for a new set-up quest with a fun ending! 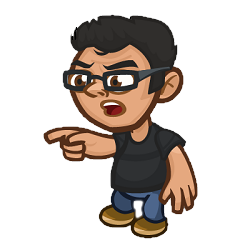 *The mini-golf piece is not included in the Nate's Finer Things achievement, and therefore it is not required to purchase it. 2016 Pet Packs --> COMING SOON!! This event runs until Friday January 29, 2016 @ Noon PST (8pm UTC). Tags: press, release, armorgames, win, best, idle, sim. VICTORIA, BRITISH COLUMBIA, January 15, 2016 – Codename Entertainment announced today that Crusaders of the Lost Idols has been named Best Sim/Idle game for the ArmorGames.com Games of the Year 2015. The ArmorGames Game of the Year Awards recognizes the very best and brightest in digital entertainment both on browser and mobile from within its portfolio vast library of published games. “To not only be nominated for an award, but to be chosen to win, is a distinction that goes beyond words. Crusaders of the Lost Idols has been, and continues to be, a passion project for all of us at Codename Entertainment. Thank you to the fans who play Crusaders and thank you to AmorGames for this recognition. We’re both honored and humbled.” said Codename Entertainment CEO Eric Jordan. Crusaders of the Lost Idols is a top rated Idle/Clicker game that has been played over 10 million times and is available on ArmorGames.com and other platforms. Fans worldwide have come to appreciate the unique formation that are unique to Crusaders in the genre. Players must utilize strategy and learn to master the art of organizing their band into the most powerful formation possible. Tags: origins, fullmetal, alchemist, alchemy, merci, wizard, upgrade. Sharp-eyed players who have a love of classic anime might recognize one of Merci, the Wizard's first upgrade descriptions. It's a line taken from the famous Japanese animated comic, Fullmetal Alchemist. If you're not familiar with the books and animated series, it centers around an alternate universe where alchemy is the most advanced scientific discipline. Today, we know alchemy as a precursor to modern chemistry and a pseudo-scientific and philosophical movement. 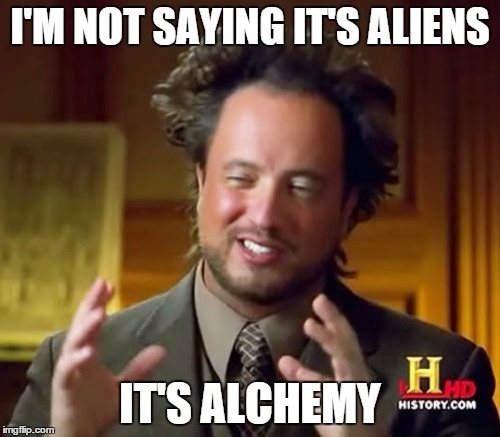 Specifically, alchemy is the pursuit of transforming base metals into noble metals, like gold, and the ongoing mission to find elixirs to achieve eternal life. To put it simply, you get out what you put into life. The Fullmetal Alchemist books themselves were a monster hit selling over 64 million copies and picking up many awards along the way. Despite lukewarm reception for the first installments, the series gathered momentum with critics citing the growing complexity as the reason it has become a fan favourite. Check out more on the official Fullmetal Alchemist website. Tags: new content, bw2, kaine. Investigator Kaine needs your help in Cloudland, Bush Whackers! If you've finished Kaine's previous mysteries and the Nate Cloudland Adventure, talk to the Town Crier in the Commons to get started.